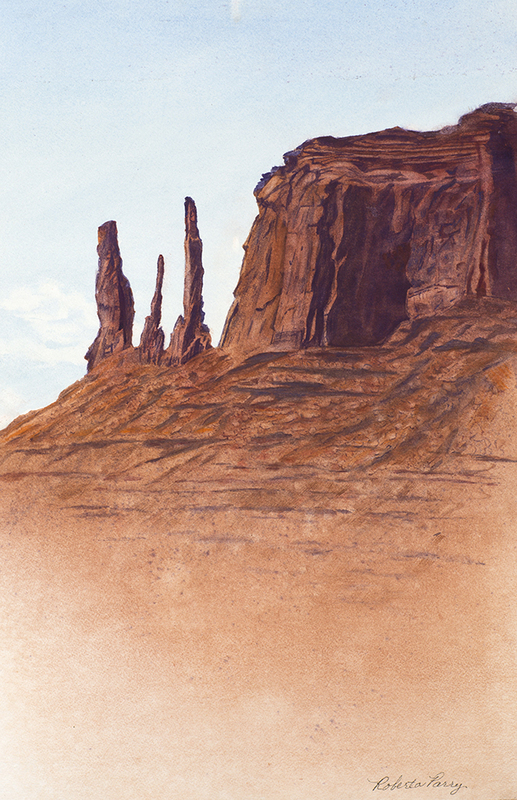 Along with her scenic Southwest landscapes series titled Southwest Moments, Santa Fe artist Roberta Parry will feature her Monument Valley, and Frida Kahlo Garden series. Parry's strong yet lyrical transparent watercolors reflect the impact on her work of light and color, and her keen sensitivity to detail. Parry takes several driving trips a year to amass photos for new work. In the studio, she selects elements from a particular group of photos to design her composition. Parry is continuously exploring and incorporating new techniques and effects to best convey what it is about the scene that draws and holds her. She loves the spontaneity of transparent watercolor and the challenge of mastering its gentle yet willful nature. As Parry says, "I may know where I want to go, but getting there is always an adventure." Parry's work has been exhibited in solo and group shows in New Mexico and Arizona, as well as public spaces in Santa Fe. She has been a visiting artist at the Four Seasons Rancho Encantado. As an Artist in Residence at the Inn and Spa at the Loretto, Parry is at her specially dedicated niche near the reception desk five times a month. You can usually find her there on Wednesdays from 4:00-8:00 pm, and Saturdays or Sundays from 10:00 am-2:00 pm, though the schedule is flexible. During her stay, Parry displays her work, paints, and engages with Santa Fe visitors from across the country and around the world. Parry expresses surprise at how many people are unfamiliar with the distinct properties and techniques of transparent watercolor as contrasted to opaque media such as oil and acrylic. Parry enjoys showing and explaining why transparent watercolor is referred to as "the master's medium" for its difficulty. Parry studied art at the University of Arizona in Tucson, and the University of Hawaii in Honolulu. She is continuing her study in Santa Fe with master artist Michael McGuire. Parry's full-sheet painting Fallen But Not Bowed was accepted into the juried Watercolor USA 2016 show. Parry is represented by Johnson's of Madrid Fine Arts Gallery.